Terry Mathews picked up the win in this April 1999 game, throwing two innings of relief without giving up a hit. The win marked Mathews' first in the majors in two years and his return to the bigs after suffering a wrist injury, according to The Associated Press. "It's real big," Mathews told The AP after the game. "It's almost better coming back than it is when you first get to the big leagues." Mathews' return to the majors in 1999 marked the start of his eighth and final season in the bigs. He amassed 22 wins over that major league career - over 324 mostly relief outings. Mathews' career began in 1987, taken by the Rangers in the fifth round of the draft out of the University of Louisiana at Monroe. Mathews started with the Rangers at single-A Gastonia. He picked up three wins over 34 mostly relief outings, with a 5.59 ERA. He moved to single-A Port Charlotte for 1988, turning starter and going 13-6. He also lowered his ERA to 2.80. Mathews first made AA Tulsa in 1989, then AAA Oklahoma City in 1990. In 1991, Mathews made the majors with Texas. Over 34 outings, two starts, he went 4-0, with a 3.61 ERA. He then returned for 1992, getting into another 40 games, with a 5.95 ERA. 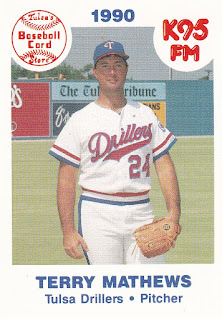 After spending 1993 in the minors with Houston, Mathews returned to the majors in 1994 with Florida. That June, Mathews went seven innings in a win, giving up one run. After that game, he spoke to The South Florida Sun Sentinel about his hopes. "I just want a chance," Mathews told The Sun Sentinel, "I think I showed a little of what I can do." Mathews got into 24 games for the Marlins that year and then 57 and a 3.38 ERA in 1995. He picked up a June win, striking out six on the mound and going 3 for 3 at the plate. Mathews later called it one of his "most memorable nights as a professional." In 1996, Mathews got into a career-high 71 games, moving to the Orioles from the Marlins mid-season. He had a combined 4.52 ERA, four wins and four saves. He helped the Orioles to the playoffs in 1997, but came up short in the Division Series, giving up two home runs in the ninth inning of a loss. The next spring, Mathews came back in shape and ready. "I think the problem was more fatigue than anything," pitching coach Mike Flanagan told The Baltimore Sun that February. "He had become the middle-innings savior. He really was, at times, the ace of that middle relief staff." Mathews got into just 17 games that year and then another 24 in 2000 with the Royals, ending his career. He went on to return home to Louisiana and he became a school resource officer with the Rapides Parish Sheriff's Office at Holy Savior Menard High School in Alexandria, La., according to The Alexandria Town Talk. He passed away in February 2012 at the age of 47 from a heart attack.